A new look is proposed for what was, until not long ago, a Tribeca spice warehouse, known as much for its wafting aromas as for its architecture. Transit Trading Corp.’s former spice importing home at 29-31 Leonard Street is slated for residential and retail conversion, with its adjacent former garage, at 198 West Broadway planned for commercial use. The Square Diner abuts 31 Leonard on the oddly shaped lot, but is not part of the project. Developer David Silvera bought the 29,500-square-foot property last year for a reported $25 million. He needs Landmarks Preservation Commission approval for a design that would bring a shiny glass-and-metal vertical assemblage of windows, on the north and south ends of the building’s largely blank east-facing wall. Glass and metal also would dominate the first-floor Leonard Street front, with separate residential and store entrances. 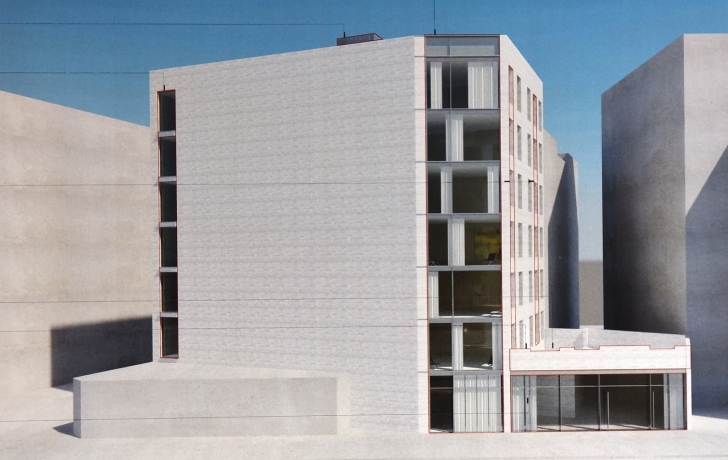 In addition, a glassy storefront is proposed for the one-story building at 198 West Broadway. The buildings’ original red-brick facade, now painted, would be exposed and restored. The project is in the Tribeca West Historic District, and Gil Even-Tsur, its architect, presented the plans to Community Board 1’s Landmarks Committee last week for advisory approval. “It’s too much of an intervention to pass a resolution that would be approving,” said committee member Jason Friedman. The two seven-story buildings, 29 and 31 Leonard Street, were built in 1881 and joined by an opening inside the buildings in 1938. The developer’s plans call for two apartments on each of five floors above the first floor, with a single penthouse on the seventh floor. The roof of the converted garage at 198 West Broadway would become a terrace for the second floor apartment.